Micron’s gaming segment – Ballistix, announces their new Tactical Tracer RGB DDR4 Gaming memory; offering stylish RGB lighting and speeds of up to 3000MHz. Yes, the company is a bit late when it comes to RGB memory modules, but it seems they came in prepared and honestly the Tactical Tracer RGB DDR4 memory doesn’t look bad either. 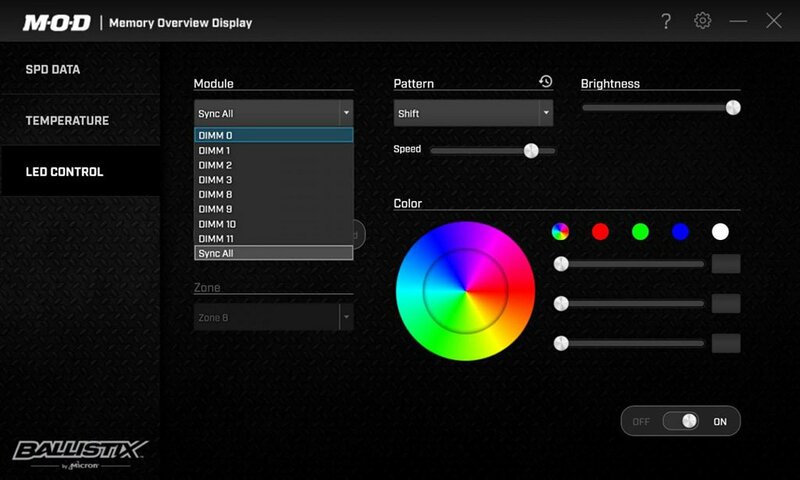 It features 16 RGB LED in 8 zones on each module, and these RGB lighting can be controlled with the Ballistix M.O.D. Utility. The utility software not only controls the RGB lightning, but it can also monitor the temperature and display SPD data of the memory as well. It’s available in speeds from 2666MHz up to 3000MHz and module densities up to 16GB or kit densities up to 64GB. The light bar can also be removed and user can replace it with a customized 3D printed light bar. More details from the official release below. Ballistix, a leading global brand of gaming memory, today announced the availability of Ballistix® Tactical Tracer RGB DDR4 memory. The new Tactical Tracer RGB modules, available in 8GB and 16GB densities with speeds up to 3000 MT/s, allow gamers to light up their systems with 16 RGB LEDs in 8 zones on each module. PC modders can customize their system’s look by removing the Ballistix-labeled light bar for maximum brightness, or 3D printing their own light bar to truly leave their mark on their memory. Tactical Tracer RGB modules also work with the Ballistix® M.O.D. Utility – software that’s designed exclusively for Ballistix modules. Gamers can use the M.O.D. Utility to monitor memory temperatures in real time, adjust Tactical Tracer RGB LED color schemes and brightness, turn the lights on and off, and switch up display patterns. PC modders can also use their motherboard’s software to sync Tactical Tracer RGB LEDs with the other components in their rig. In addition to increasing personalization, users get all the features of the Ballistix Tactical series including XMP profiles, stylish black PCB, and custom heat spreaders. The Ballistix Tactical Tracer DDR4 RGB modules are available to purchase at Crucial.com and through select global partners. All Ballistix memory is backed by a limited lifetime warranty. For more information about Ballistix memory and to download design files for your 3D printer, visit https://ballistixgaming.com/3d-print-files.